I spent last week at my mother in law’s in Florida lamenting the fact that I have to drive 40 minutes to the closest Whole Foods while her kitchen was stocked with delicious fruits, vegetables, sustainable meats and the like from her store 5 minutes down the road. Then yesterday, I finally made it to the newly opened 40 minute away store by me and pushed my cart around each aisle as 2 little voices carried away on my shoulder. Voice #2 won out for the most part but I did somehow get suckered into some perfect looking red leaf kale, an assortment of pick your own mushrooms, mangos, local organic grass fed skirt steak, the kimchi bar and kombucha…for $71. Ok, maybe there were a few other small items. But $71?! There were 2 bags, but I’m pretty sure the cashier just did that to make me feel better because it easily could’ve all fit into 1. So here’s my question, do people actually shop at Whole Foods regularly? Like, “oh, we’re out of milk and eggs, let me just pop into Whole Foods real quick!” Because I’m pretty sure we’d be bankrupt in about 2 months if that were the case. So these quesadillas are brought to you by my little ghetto produce store’s tuscan kale ($1.39 vs. whole foods $3.49), a can of non-organic (ah, the horror!) cannellini beans (Goya $0.99), some seriously sharp Cabot cheddar cheese they so graciously sent me (free) and Trader Joe’s whole wheat tortillas ($2.69). Because I’d rather have money left over for more vacations than eat exorbitantly priced (albeit cool) black spaghetti. Holy yum! This looks fantastic! So full of goodness too! Perfect runner food, and perfect for when I begin my serious nutritional knuckledown next week! YUm! These are like the quesadillas of my dreams! And I’m totally intrigued by that DIP!!! Now that is my kinda quesadilla! Love the idea of the barbecue sauce and yoghurt dip!!!! Yummy! Oh my these love amazing! I need to have these for dinner this week :) Pinned! I’m always looking for a way to use beans more… especially other than just black bean salsa :) Great idea! Love white beans! This is my kind of quesadilla! I agree with you. It’s so sad that “good quality” food has to be so crazy expensive. I have some basic principles regarding food shopping… I prefer organic milk; organic, cage free eggs; and organic grass fed beef (which we buy rarely coz of the $)… as for produce, we mostly never eat any veggies raw, so we don’t buy organic produce. As for fruit, I only buy organic if I eat the skin (i.e. apples), everything else, nah. I would rather fo for these homemade “ghetto” quesadillas than the Whole Foods food bar. These quesadillas look so good! I love a non traditional twist on a ‘dilla any day. And what a fun add in with the beans!!! And Whole Foods is scary..b/c I always end up spending a gazillion dollars. And I forget how I did it. I just get completely sucked into the store and wake up once I’m back in the car gasping at the receipt!! Whole Foods is the closest store to my home, so I do shop there more than I would like. What I would like, however; is a whopping serving of these yummy quesadillas! Dude! pahhahaha! Love this! They do have an amazing hot foods bar… love to go there to get ideas and see what’s trendy. 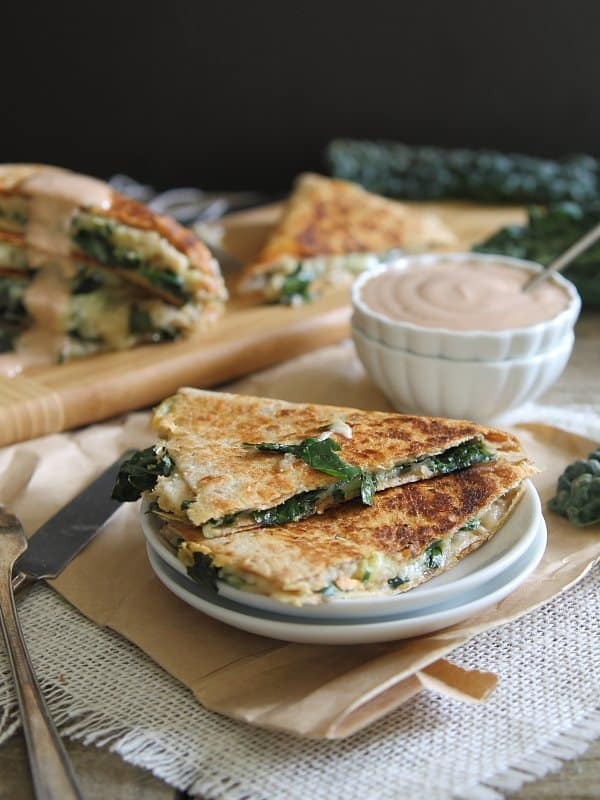 What a fun take on a a quesadilla – love the combo of ingredients here. This will be great for a quick spring meal!! 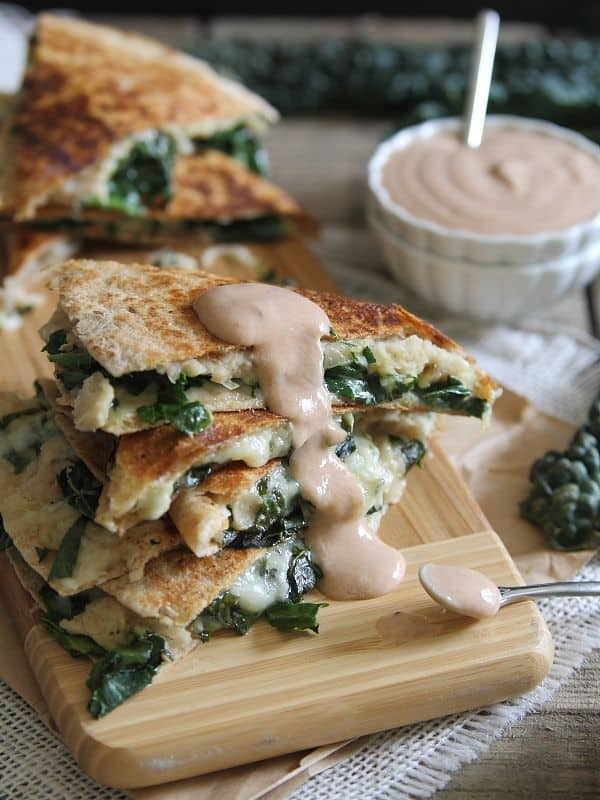 Quesadillas are one of my favorite lazy meal go-tos and these look delish! I might even sneak in some shredded chicken to make them no longer vegetarian. This post is so funny Gina. Believe it or not I have found bloggerss who say they shop at Whole Foods for most items. Guess they are rolling in the $$$$. Going to Whole Paycheck is a treat for me. I shop at our local HEB in Texas. I agree! I always drive past Whole Foods and their equivalents to make it to a family-owned and operated “farmer’s market-like market” that focuses on local produce, meat and dairy. Everything is amazing, and it’s only a fraction of Whole Foods’ prices. Also, I have no shame in admitting that most of my pantry items come from Aldi’s. You’d be surprised with how many good quality products you can find when you are willing to separate quality from brand names, and you let the food speak for itself! couldn’t agree more! I’ve been meaning to check out Aldi’s for some time now. I say go for it! Many people don’t realize Aldi’s actually owns Trader Joe’s (not that TJ is fancy or anything) and the quality of their products are comparable. Pantry items are good (beans, canned veggies, tomatoes and tomato sauces, sugar, flour, pasta and oatmeal). Their non-fat plain yogurts (regular and Greek) are really good, as well as some cheeses. They actually have good beef (steaks, roasts and ground), but I don’t buy their other meats or cold cuts because they are either processed or have too much salt. Their cooking ware is pretty decent. Produce is hit or miss (more misses than hits), so I usually avoid it. Whoa, back it up! Did someone say KALE? Made these last night–easy and very delicious! Love your site, Gina! Totally making these for an uncommon Cinco de Mayo. And we shop at whole foods for almost everything. I did it when I was a poor grad student on a stipend too. Just go with a list, don’t buy prepared things, and don’t impulse buy. Even buying all organic my grocery bill is lower than my friends. It is possible! This sounds delicious! I would not have thought of the creamy BBQ dip to go with this type of food, but I bet it will taste great. just saw this on Pinterest. . oh my gawd. . delicious! can’t wait to try this! ok and I have to comment on Whole Foods. . I only shop there when I absolutely need something that I can’t find anywhere else. . now, this isn’t because I don’t want to. . my eyes light up whenever I’m there and I always end up spending $71 on like 6 things. . just like you. I shop regularly at my local grocery, Metcalfe’s, which actually sells a lot of local produce from local growers here in Wisconsin. . which I love. otherwise, the other more chain grocery stores aren’t that great. The produce is bad and wilted. . so if I only had the choice of that vs. Whole Foods, you’d better believe I’d be saving money elsewhere to make up for the crazy amount I’d be spending at Whole Foods. What is the nutrition info on these? Looks really yummy! I just spent way too much money at whole foods yesterday. I justify it by reminding myself that I only shop there once or twice a month. But I think there are quite a few people who do most of their shopping at whole foods and I don’t know how they do it. 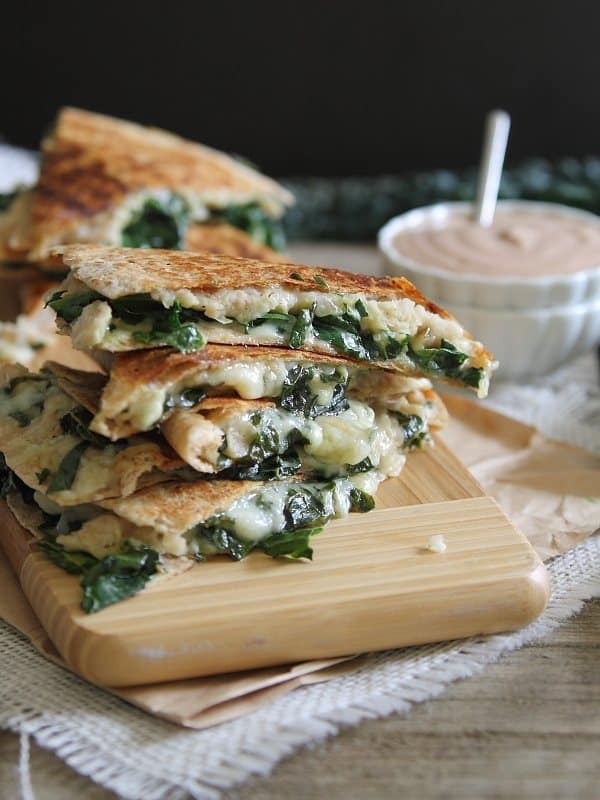 Love, love these quesadillas. The kale looks perfect and that barbecue sauce really sainds amazing. Made these tonight. Really liked the quesadillas, but not a fan of the dipping sauce. There are so many different BBQ sauces, maybe I just picked the wrong one. Next time I think I’ll try them with a tzaziki sauce. I’m glad these turned out good because they were a pain for me to make! A bunch of cheese burned on to my skillet and it took forever to scrape off. I’m going to try to make these again but on a panini press. 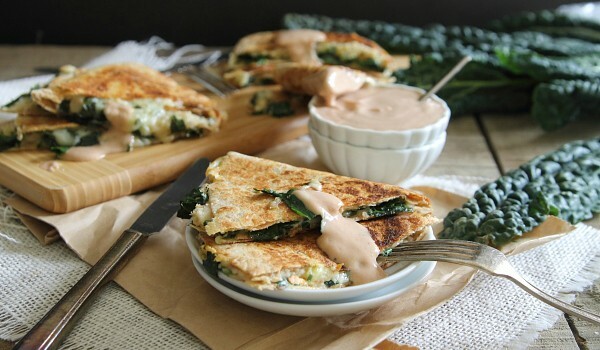 The white bean mixture in these quesadillas were delicious! Dang. Maybe try a copper pan? My burnt cheese slipped right off. These tasted so amazing and so did the dip! I found this pin on Pinterest. I can tell you I do not buy at whole foods. The closest one to me is about 40 miiles away too. I know that they carry lots of “good for you ” foods, but I am not rich. I can buy tons of fresh veggies and produce, as well as clean meats at my favorite stor ALDI and other small markets. We solely purchase our food from natural food stores—Natural Grocers for most things, Whole Foods for a few things, and our local Co-op for some things—and our cart is >95% organic and we are not wealthy by any stretch of the imagination. It can be done. Like another commenter said, she goes with a list and sticks to it. You have to buy smartly and simply and really be willing to make meals from scratch. I meal plan for a week at a time and stick to the list. The receipt is not that shocking considering we are buying a week’s worth of groceries. For reference, I can buy a can of Field Day organic white beans in a bpa-free can for $1.49 at my local co-op, which does not seem out of line at all. Buy dried beans and you’ll save even more. We seldom eat out, which obviously makes a huge difference. We don’t buy organic food or shop at these places because it’s trendy or cool, we buy because we value it. You would rather go on vacations and whatnot like you said, instead of putting organic food into your body everyday. I can’t remember the last time we went on a real vacation. We live extremely frugally in our day-to-day lives, but we don’t compromise when it comes to quality of food. It all depends on your priorities. So short answer is, yes!, people really do shop at these places in their everyday, real-life! Thanks for the recipe; looks yummy! FYI, these were delicious!! The simple BBQ sauce was a perfect match. I love love love this recipe! I made it tonight with Swiss cheese instead of cheddar, and a combo of kale, spinach, and chard and it tasted amazing. Thanks for the inspiration!